Imagine you are given a chance to set up a physical store. 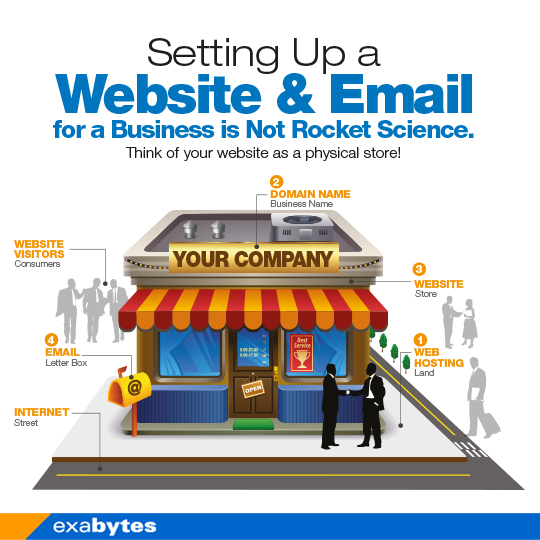 Do you realize what you will be doing is in fact the same as setting up a website? LEARN MORE from the below infographic! Finding a patch of land to build your store is just like looking for a patch of online land to place your website and emails on. This online land is called web hosting; something similar to a rented land which comes with a monthly / yearly fee. Next you need to get your store a name (brand) so that people can recognize and find it. This is the same as registering a domain name (eg: yourcompany.com) for your website from a web hosting provider or domain registrar. You need a blueprint and a contractor to build your physical store, just like a website needs a layout plan and a web designer to build it. After your hosting account is set up, create @yourcompany.com email accounts using the hosting control panel. In web hosting, an email service is similar to a letter box and super fast carrier pigeons. Next article1000 Blogger Ads Program!